CABLE HIGHLIGHTS: Discovery’s GOLD RUSH took the Friday cable title with a 0.05 bump to 0.79, with lead-out FINDING ESCOBAR’S MILLIONS up 0.05 to 0.40. ESPN’s NBA game was at 0.63, sandwiched by COLLEGE BASKETBALL games at 0.31/0.30. On HBO, REAL TIME WITH BILL MAHER jumped 0.17 to 0.59, and TRACEY ULLMAN’S SHOW was up 0.05 to 0.14. A&E’s LIVE PD ticked down to 0.58. Nickelodeon’s early-evening SPONGEBOB was in the #5 slot at 0.42. Food Network’s DINERS, DRIVE-INS & DIVES returned at 0.36. Bravo’s DON’T BE TARDY rose 0.09 to 0.35, preceded by MARRIED TO MEDICINE at 0.28. Fox Sports 1’s COLLEGE FOOTBALL game was at 0.34. Fox News’s TUCKER CARLSON TONIGHT won the night’s cable news war at 0.30/0.47/2.8M, far ahead of MSNBC’s ALL IN WITH CHRIS HAYES AT 0.20/0.30/1.9M, and CNN’s early morning CNN NEWSROOM at 0.19/0.26/800K. 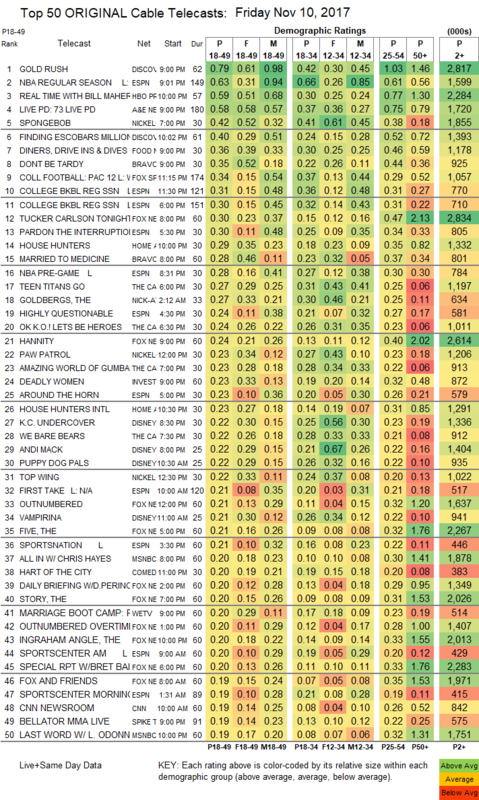 On HGTV, HOUSE HUNTERS gained 0.09 to 0.29, and HOUSE HUNTERS INTL was steady at 0.23. Cartoon Network had a pair of early-evening shows in the Top 20, TEEN TITANS GO at 0.27, and lead-out OK KO LET’S BE HEROES at 0.24. ID’s DEADLY WOMEN edged up 0.02 to 0.23. 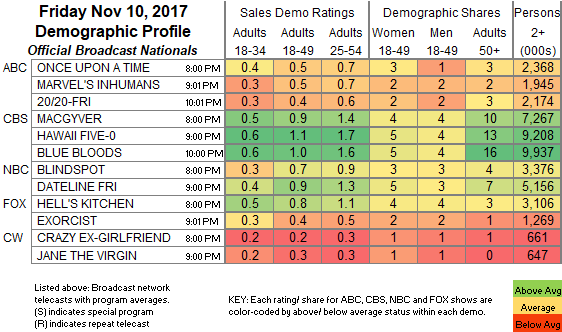 We’s MARRIAGE BOOT CAMP climbed 0.02 to 0.20. Spike’s BELLATOR ticked up to 0.19. On Syfy, Z NATION ticked down to 0.18, and SUPERSTITION was down 0.01 to 0.09.